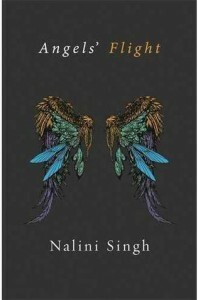 ANGELS’ FLIGHT is a compilation of four short stories written by Nalini Singh and set in her GUILD HUNTER series. Three of the four stories have already appeared, with ANGEL’S DANCE being the only new addition to the compilation. In the short stories Singh gives voice to the stories of characters who have only been minor players in the main series – readers of the GUILD HUNTER series will recognise them because although they are only minor, each has played an important role in the main series. I just wanted to start this review by saying that until I read ANGELS’ FLIGHT I had not read any of the novellas featured in the collection. This is down to a number of reason; partially because I wasn’t aware that Singh had released them, and partly because the short story/novella format is not one I often enjoy. ANGELS’ FLIGHT was an exception to this. I really enjoyed reading all four short stories and would have read them all in a single sitting, but I had to sleep – being up at gone 2am is rarely sensible. The first story in the collection is ANGELS’ PAWN it tells the story of Ashwini (a friend of Elena, and fellow Guild Hunter) and Janvier. Singh did a really good job writing the tension between Ashwini and Janvier, and answered some of my questions about their relationship from mentions of both of them in the GUILD HUNTER series. I also liked the fact that although the story very much focuses on the romantic tension between them, there is also a really good plot running through the story. The second story ANGELS’ JUDGEMENT tells the story of Sara (Elena’s best friend) and Deacon, both of whom are Guild Hunters. This story is quite unusual as (I believe) this is the first story with the focus on romance between two humans. It was also plot heavy, which was awesome. I also enjoyed seeing Sara rise from being just one of the rank and file to the position we are more familiar seeing her in – the Guild Director. The third story ANGEL’S WOLF tells the story of Noel and Nimra. Noel was one of the minor characters in ARCHANGEL’S KISS. This story was all about the plot with the romance playing a hot second. This was probably my favourite story in the collection as I really enjoyed watching Noel and Nimra dance around one another. I also thought Singh wove the plot brilliantly, and I had no idea what was going on until the revelation. The fourth story – and the only one not to be published before – was ANGEL’S DANCE. It told the story of Jessamy and Galen, both have appeared in the main series. It was also probably my least favourite of the collection, but I still really enjoyed watching the events play out on the page. If you are a fan of Nalini Singh’s GUILD HUNTER series and haven’t read any, or all, of the stories in this collection then you should seriously considering getting your hands on it. You shouldn’t be disappointed.